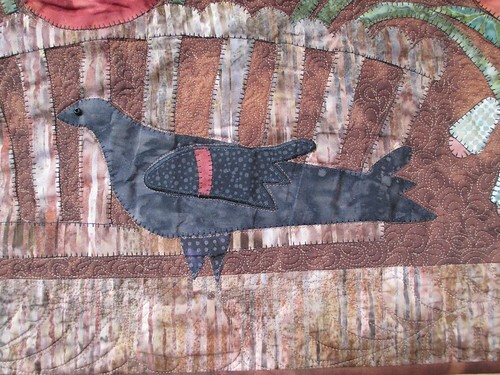 The pattern for this topper was from the January/February 2012 issue of “Quiltmania” magazine. 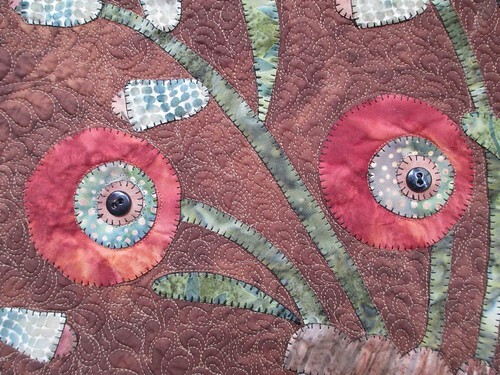 The design was by Maggie Bonanomi for Blackberry Primitives. 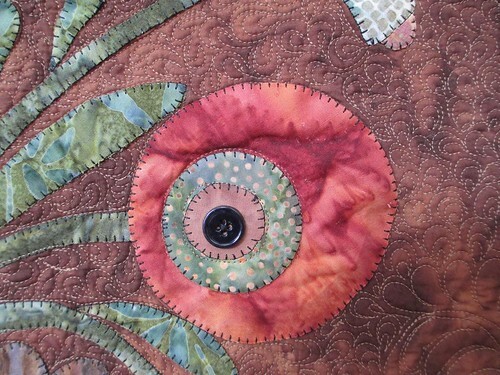 The original used wool fabrics, but I used batiks from my fabric stash. 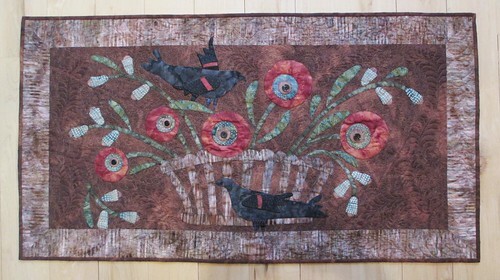 I added a border of fabric that matched the basket fabric. 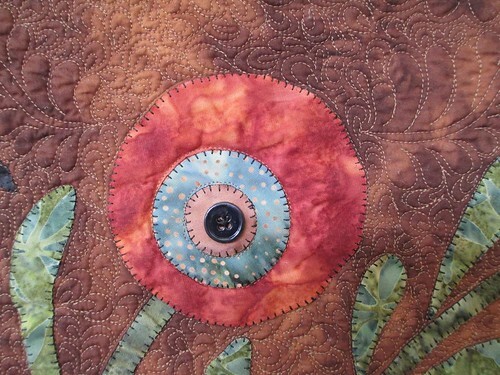 For the center of the flowers I sewed on black buttons instead of appliqueing the final smallest circle of fabric. Also, I used beads for the birds eyes instead of French knots. Close-ups of the two birds. 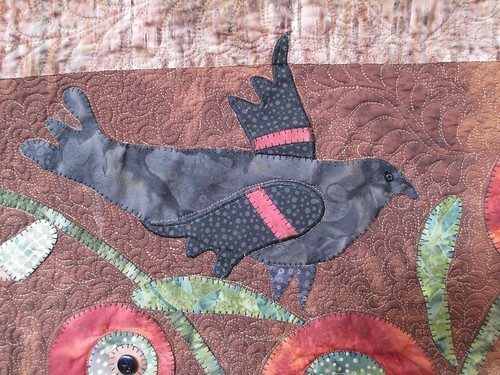 Most of the appliques were outlined with a machine blanket stitch, however, I used a satin stitch on the birds’ wings to give them more definition. 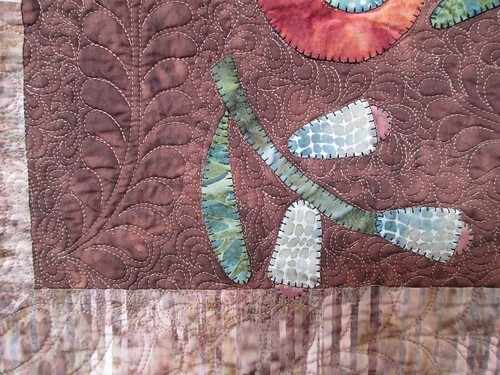 For the background quilting, I scattered a few larger feather fronds and then quilted a smaller paisley shape all over to fill in. 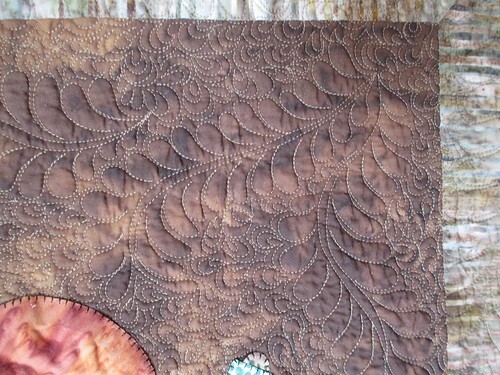 The border was mitered at the corners and outline quilted with a feather ending in a heart shape at the top and bottom in the middle. To view a slide-show with more pictures click here. 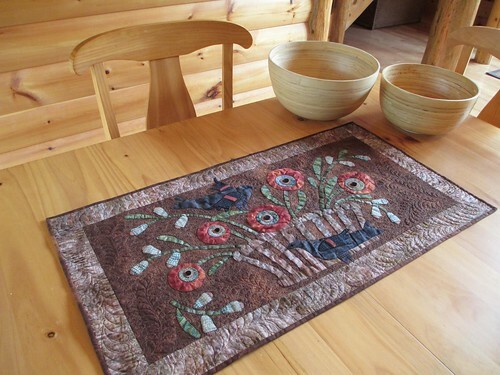 This entry was posted in Garden Table Top Basket, Quilting. Bookmark the permalink. 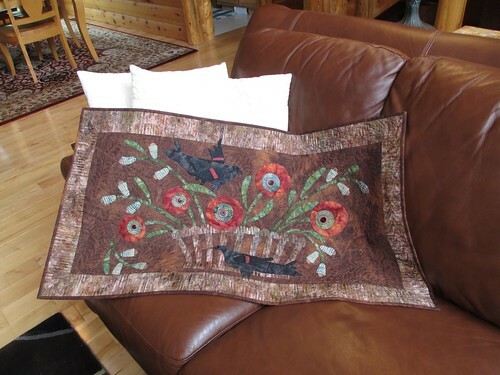 The quilting on this is beautiful! Very neat and pretty!! 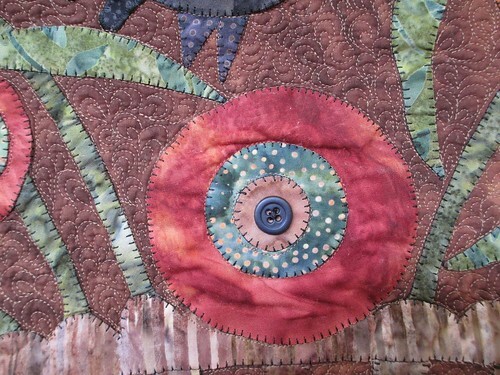 I like the buttonhole? stitch you use instead of whip stitch. I am going yard saling in a little while just around Leopold area. This is Perry County dogwood weekend. Simply, charming…Another really nice job! Lovely, lovely Joyce. I always marvel at everything you do. Thanks as always. Always nice to hear from you, Betty. Sally shared pictures of your new “toy.” Wish I could hear you play.